New e-Matrix Sublative Rejuvenation or eTwo is the newest innovative sublative fractionated bi-polar radiofrequency technology for skin rejuvenation placing the non-laser fractional energy into the upper dermis where it can produce a significant increase in both collagen and elastin synthesis with minimal epidermal disruption. In the past decades ago, laser for skin resurfacing and rejuvenation to promote new skin cell growing and collagen production is ablative. 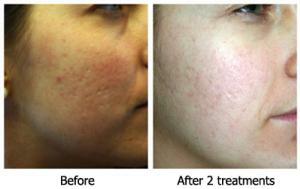 People had experience with sevaral weeks of downtime such as raw surface, bleeding, redness and hyperpigmentation. Now e-Matrix sublative fractional skin rejuvenation is the latest generation of energy based device that can significantly promote collagen synthesis with less downtime without bleeding and our eTwo or eMatrix is the first new device in the Southern region. Benefits from ematrix/eTwo sublative fractional rejuvenation- acne scar, static line and pore reduction, jawline reshaping, skin tightening, skin resurfacing. Our clinic has offered eMatrix/eTwo procedure since the lastest generation of eMatrix/eTwo lauching in Thailand so we are the pioneer providing eMatrix/eTwo services in Thailand. The unique sublative applicator of eMatrix/eTwo delivers bi-polar fractional radiofrequency energy via the e-matrix electrodes of the disposable Tips. This fractional delivery of eMatrix/eTwo RF energy causes micro-epidermal ablative injuries with wider spread dermal coagulation. e-Matrix or eTwo sublative fractional rejuvenation initiates a strong wound healing response in the dermal matrix while also minimizing the damage to the epidermis. Less affected tissue surrounding the matrix points may be stimulated by heat which helps accelerate the healing process, leading to a smoother, rejuvenated appearance of the skin. 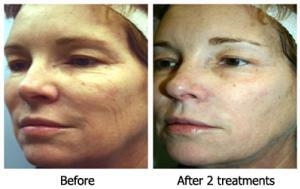 How does e-Matrix/eTwo Sublative fractional rejuvenation work ? The ergonomic eMatrix applicator delivers bipolar fractional radiofrequency energy via e-matrix of 64 and 144 electrodes in the disposable applicator tip. The RF energy from e-Matrix Gold generates fractional deep dermal heating in the region of the electrode e-matrix to induce skin injury, thus eliciting a wound healing response. Mild to moderate wrinkles and superficial skin discoloration will reduce, and skin texture becomes smoother and more elastic. What is the differnce between e-Matrix/eTwo Sublative rejuvenation and fractional laser or other fractional RF? Currently, only eMatrix sublative can produce the unique pyramidal shape of fractional RF energy. 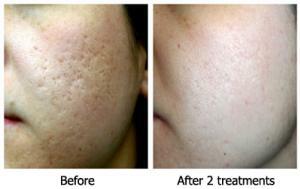 The more e-matrix energy disrupted in dermis, the better collagen remodelling occurs. The less e-matrix fractional energy interrupted in epidermis or upper skin layer, the less possibility for adverse effects can occur. The other energy-based devices or fractional laser may have coherence beam or reversed pyramidal column of RF energy which cannot produce the significant amount of collagen and elastin production as e-Matrix Sublative fractional rejuvenation. During the eMatrix sublative procedure, skin resistence will be continuously monitored and the depth of the fractional energy can be estimated. 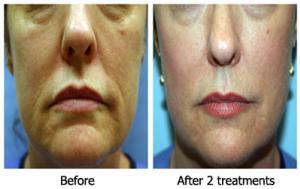 Who should be treated with eMatrix/eTwo sublative fractional rejuvenation? 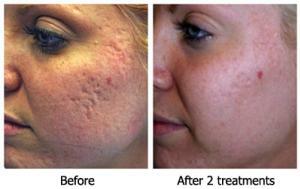 eMatrix/eTwo sublative fractional rejuvenation is a safe and effective solution for all skin types. However, not only improving all types of acne scars, excellent candidates for eMatrix will be persons with large pore, lines of wrinkles, laxity of jowls and upper eye lids and mild to moderate nasolabial folds. 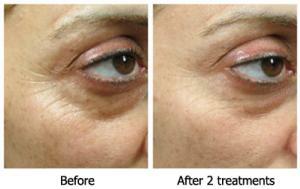 When can patients expect to see results from eMatrix/eTwo sublative fractional rejuvenation? 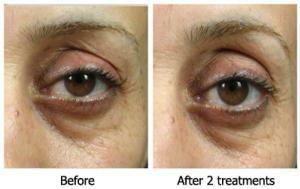 Typical eMatrix/eTwo sublative treatment protocol is 3 treatments, 4 - 6 weeks apart. 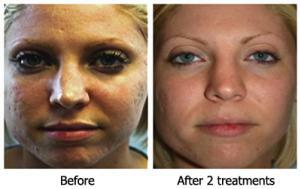 The total number of required e-Matrix treatment sessions depends on the skin conditions of the patient. How is the e-Matrix/eTwo sublative skin treatment tolerated by patients ? During eMatrix sublative fractional RF treatment, many patients feel a warm, prickly sensation as energy enters their skin. After treatment a pink or red "sunburn" appearance and feeling is also common. Topical anesthetic ointments and cooling are often used to reduce discomfort during treatment.